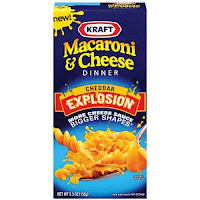 I can tell the difference between Kraft and other brands of mac and cheese -- with my eyes closed! While I usually like to indulge in the varieties that include the creamy cheese in the packet that you squeeze out, I have found a new flavor that tastes just as cheesy (but with a powdered cheese packet.) It's the Cheddar Explosion flavor, and it is Sooooooo good! You can find out all about the new flavors at Kraft's mac and cheese website!